Brazil produces some truly exceptional coffees and micro-lots, proof that speciality coffee does not have to be limited to just the small-scale grower. Consumption has been increasing by around 5 percent annually. 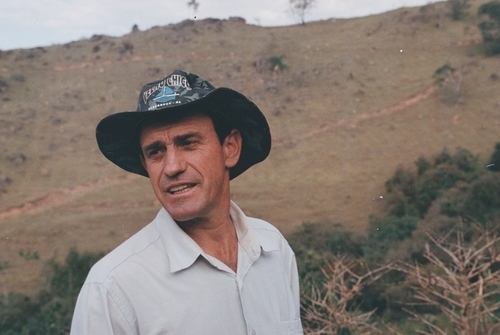 The producer at Santo Ambrosio, Paulo Mengali is one of the more progressive producers in the region. While focusing purely on the traditional natural process his work with different varietals is exceptional. Currently 16 different newly planted varieties of yellow bourbon take up one corner of the farm ready for production in 2019, and 90 hectares of yellow Bourbon Experimental coffee is planted in the new area of Talhao da Fegueira. Paulo Mengali has earned a position as one of the most respected producers in Divinolandia through his experimental approach and consistent quality. His coffee is sun dried on patios overlooked by a small chapel. The varietals are Red and Yellow Catuai, Bourbon and Obatan at an altitude of 1180 metres above sea level.